The Midnight Review: Mitt Romney: "I Am Not A Business!" "I am not a business." Mitt Romney said corporations are people and deserve the same rights as humans. Mitt Romney cites his experience with Bain Capital as a qualifier for the presidency. Mitt Romney fancies the idea of changing the Constitution to require a presidential candidate to have at least three years business experience. Mitt Romney believes his business acumen should not be debated. 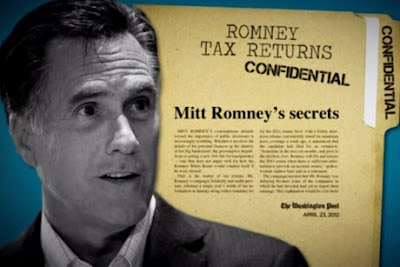 Mitt Romney won't release his personal income taxes. When asked if he would invest in a business that claimed to have expertise in business and finance but refused to release years of taxes, Mitt Romney responded with the following: "I am not a business." So the man who cites his business experience as his main qualification for the presidency and who toyed with an amendment to the Constitution setting up a business prerequisite also wants his business record to be protected from criticism. He also believes corporations are people but does not believe people (more specifically - Mitt Romney) should be treated like corporations. Would you vote for a candidate who claims to know what's best but refuses to talk about the basis for such claims?